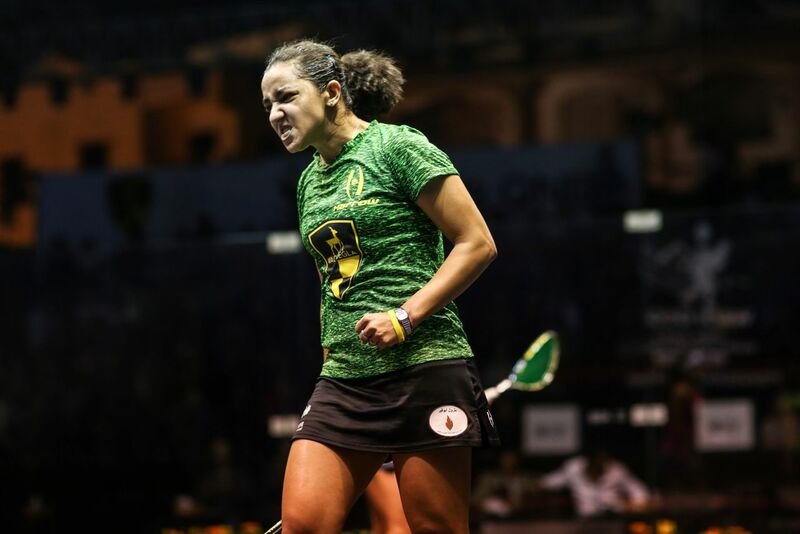 Egypt’s World No.4 Raneem El Welily claimed the inaugural 2016 Wadi Degla Open title after overcoming compatriot Nouran Gohar in the final of the PSA W50 tournament taking place in Cairo. The duo are both representatives of the prestigious Wadi Degla Club and it was El Welily who took an early lead after coming through a nervy start and a flurry of errors to go a game ahead, only for Gohar to capitalise on some loose shots from her opponent in the second to draw level. Gohar’s comeback was short-lived though as El Welily worked her way back into the contest, moving the younger Egyptian into all four corners of the court as she restored her lead in the third, before an unstoppable display in the fourth and final game saw her surge to victory, closing out an 11-8, 7-11, 11-4, 11-5 triumph to lift her second PSA World Tour title of the season. "I’m absolutely happy, Nouran is such a tough opponent, she’s a great player," said El Welily. "It’s a pleasure playing with her in the final in front of the Wadi Degla Club and I’m really happy that I managed to win today. "I was trying to get the ball to the back and was volleying as much as I could. I was trying to do that in the second, but then my length got short and I had to find another way to get the ball to the back. I’m really glad I found a solution there, otherwise it would have been a nightmare." 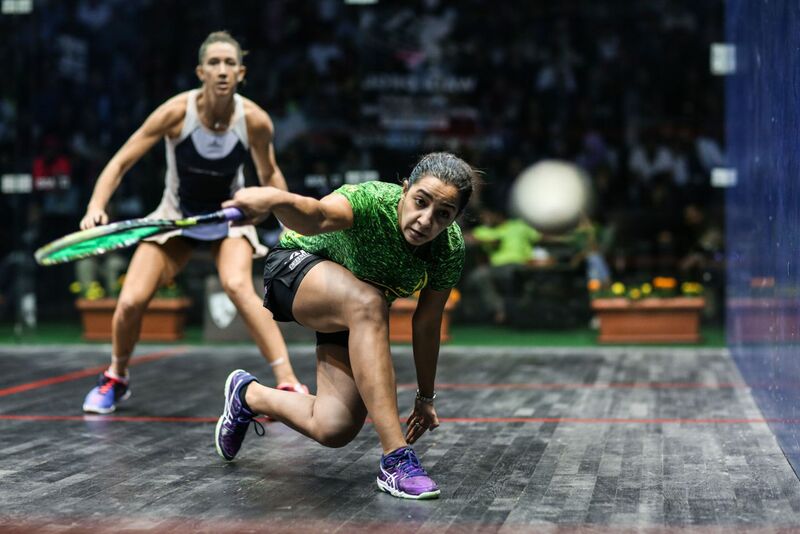 Egyptian World No.3 Nouran Gohar and World No.4 Raneem El Welily will face off for the title of 2016 Women’s Wadi Degla Open Champion tomorrow when they meet in the final of the PSA W50 tournament taking place at their home club in Cairo. The duo, both of whom train and play at the Wadi Degla club, came through contrasting yet challenging last four battles with eight-time World Champion Nicol David and Welsh qualifier, and tournament surprise package, Tesni Evans to set up what will be their sixth PSA World Tour encounter and their second title-decider. It was El Welily who triumphed when the pair met in the 2014 China Open final and she secured her place in tomorrow's finale after banishing the demons of her World Championship final defeat to Malaysian Nicol David on Egyptian soil two years ago. El Welily held four championship balls in that encounter but put the record straight by coming from behind in the fifth to secure victory this time around and book her place in the final. "Even in the last few points I don’t think my head was there anymore but she made the errors and I’m really grateful for those," said El Welily. "I wasn’t [thinking about her World Championship final defeat] until before the match. Then in the fourth game it kind of came back. I was down in the entire fifth and I think the memory from last time gave me the push to not quit and to keep pushing harder." Gohar, the 19-year-old World Junior champion who has already ascended to No.3 on the World Rankings, came through her encounter with Evans in more comfortable fashion, prevailing 3-1. "I realised in the third that my pace wasn’t as high as it was in the first two games," said Gohar. "I was trying volley as much as I could in the fourth and I was trying to get my concentration back and make it faster. "Raneem and I train a lot together here at the same club and I’m glad we both got to the final. It’s such an honour for us to play in this club in front of this crowd tomorrow." 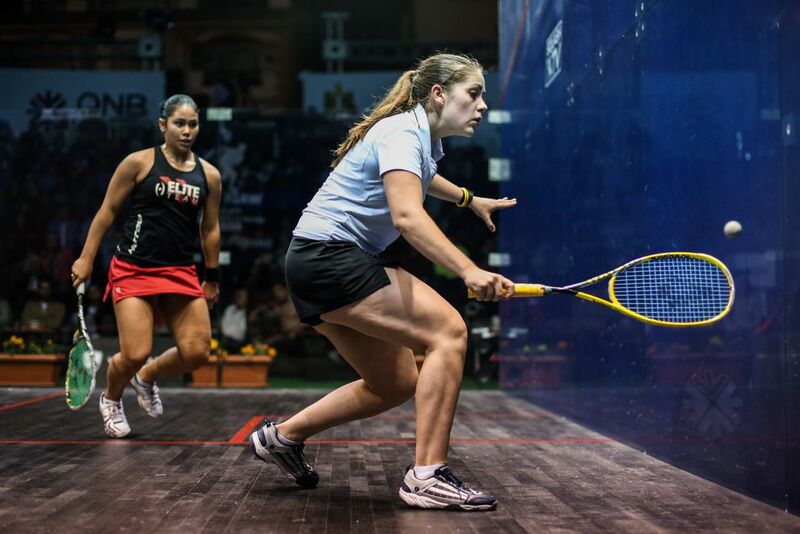 Welsh World No.28 Tesni Evans will compete in arguably the biggest match of her career when she takes on World Junior Champion and World No.3 Nouran Gohar in the semi-finals of the Women's PSA W50 Wadi Degla Open . Evans had to come through two qualification encounters just to reach the main draw of the tournament, which features the likes of former World No.1s Nicol David and Raneem El Welily, before downing number six seeded Delia Arnold to reach the last eight where she came through in four games to defeat Egyptian Salma Hany Ibrahim. The 24-year-old will face a stiff challenge against Gohar who will be playing in front of a partizan crowd in what is her home club. "It feels amazing to reach the semis," said Evans. "Coming into this I was just hoping to qualify, let alone make the semis, so I’m really happy with how I’ve been playing. "It would mean everything to make the final. It’s going to be a very tough match, but it would make my day if I came through." Gohar meanwhile secured a routine straight-games victory over Marian Metwally, coming through unblemished after just 31 minutes of play. "Playing at your home club in front of your home crowd is unbelievable, so I’m trying to give everything and do my best to reach the finals here," she said. "It will me my first time playing against Tesni, but she is very tough and she beat Salma today, which is an unbelievable achievement. It will be a great match tomorrow and I’m sure it will be tough." 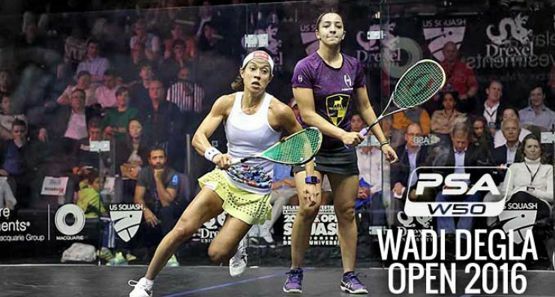 The semi-finals of the Women's Wadi Degla Open, the PSA W50 tournament taking place in Cairo, Egypt, will see former World No.1s Nicol David and Raneem El Welily go head-to-head on Egyptian soil for the first time since the 2014 Women's World Championship - when David saved four match balls to win her eighth world crown and deny El Welily an historic win. Since that win David has won just one from four encounters with El Welily and, with the duo currently sitting at No.4 and No.5 on the World Rankings, they came through their respective encounters with Nour El Tayeb and Donna Urquhart to set up what promises to be a highly competitive last four battle. 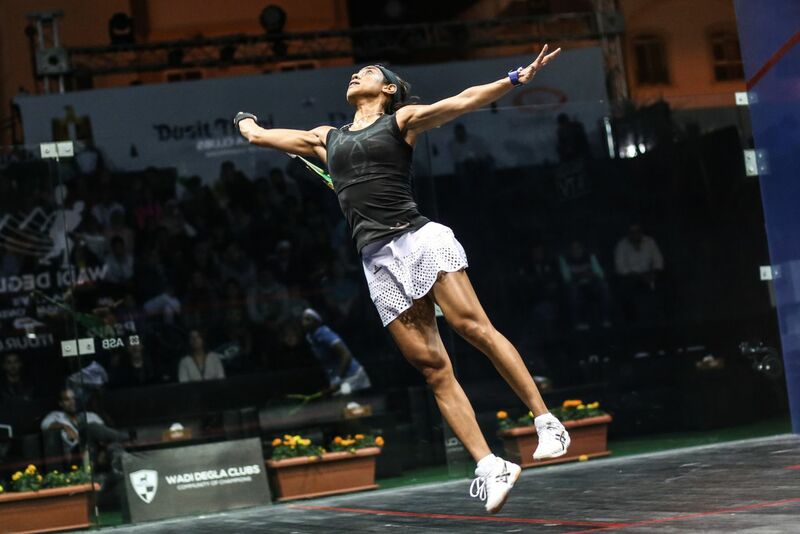 David has failed to reach a final on her last nine PSA World Tour outings but put in an impressive performance to come from behind, edging a decisive second game 12-10, to see off El Tayeb in a victory that will bolster her confidence as she seeks to rediscover her title-winning form in Egypt. "I had to really step up and stay composed with that I needed to do today," said David. "She has flair when she has time and is really hard to read. I needed to enforce my game, I needed that second game to push me through to the end. "My consistency paid of today and I needed to stay in there and work as hard as I could, because you don't want to be staying in there too long. I'm just pleased to win 3-1." El Welily also secured her semi-final place courtesy of a 3-1 win, recovering from dropping the second game against Urquhart to come through. "I had a mental crack, a storm of a bad attitude that I was trying to control," said El Welily. "Luckily I managed to get over my demons inside and get the win. Next match I'm hoping I can play as well as I played the last time against Nicol. "It's all about containing myself and my attitude. I'm going to try to get the best out of the rest day tomorrow and get ready for the match. " 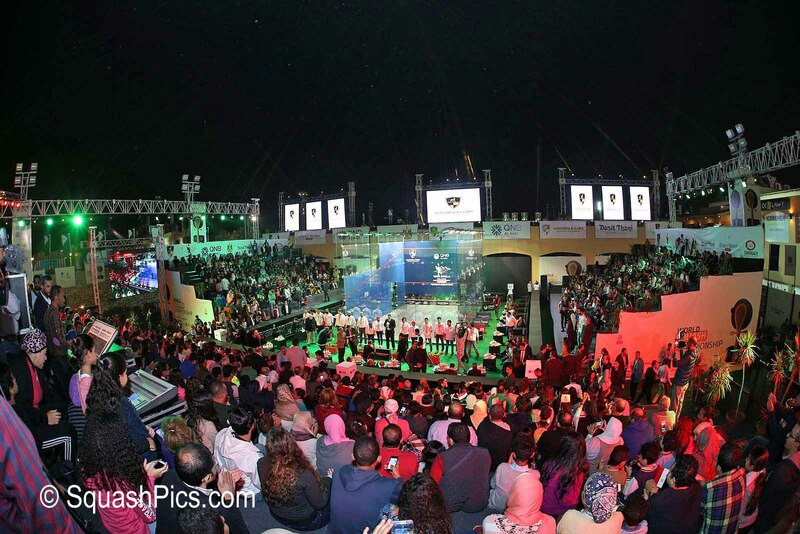 A triumvirate of qualifiers shook up the Women's Wadi Degla Open as main draw action at the PSA W50 tournament got underway in Cairo today with Welsh number one Tesni Evans joining Egyptian duo Salma Hany Ibrahim and Mariam Metwally in securing unexpected places in the quarter-finals. Evans, World No.27, put in a display of typical shot-making artistry as she secured a 3-1 win over number six seeded Delia Arnold of Malaysia while Ibrahim downed World No.8 Omneya Abdel Kawy in straight games, taking advantage of her elder compatriot's lack of court-time since getting married earlier this season. The pair will now meet in the quarter-finals where victory for either would take them through to arguably the biggest match of their careers. “I'm really happy with that win,” said Evans., who secured the match with a surge from 2-6 down in the fourth game to take it 11-8. “There were a few thoughts in my head when I was 2-0 up. I've had a lot of five game loses in the first rounds of tournaments and it was in my head that this could be going to five again. So I'm a little frustrated that I didn't see it out in three, but in the end it was a case of relief more than frustration. Metwally meanwhile put in a gargantuan effort to come form 0-2 down to defeat Dipika Pallikal Karthik. It was the Indian number two who controlled the early proceedings, dictating the play and hitting with ferocious power to take the opening two games without much difficulty but the World No.19 went completely off the the boil in the third game, losing her intensity and looking sluggish. Metwally took full advantage, outplaying, and out-thinking Pallikal Karthik to set up a last eight battle with Nouran Gohar. "My coaches told me, after the second, just to enjoy my game and forget about the score," said Metwally. "The last time we played I beat her and I think maybe I had a little bit of pressure on myself that I should beat her today. After the second I think my game started to come together and I'm really, really happy with that win. Gohar saw off Wildcard Amina Yousry in straight-games to secure her last eight spot with top seeded Nicol David also getting her campaign off to a comfortable start with a 3-0 win over Denmark's Line Hansen. “I think I started well and got through that match quite solid,” said David. “I maybe went off slightly at the end of the third game so I just had to make sure I stayed in there to get those last few points to take it 3-0.